Orlando, FL - Saturday, May 11, 2013 was a day to remember for the faithful of the St. Petka Church in Orlando, Florida. 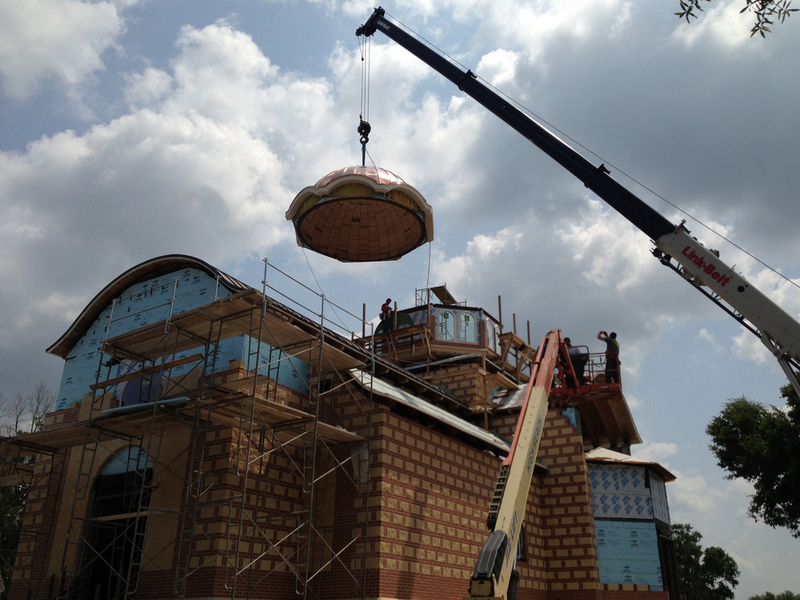 Exactly two years after construction on the new church began many Orthodox faithful from Central Florida and other areas gathered to attend the liturgy and the blessing and raising of the main dome and cross for the new church. The Divine Liturgy was served by a number of local Orthodox clergy. Officiating was V. Rev. Stefan Zaremba, the Dean of the St. Petersburg Deanery for the Serbian Orthodox Diocese of Eastern America. Following the Divine Liturgy the dome and cross were blessed after which it was raised on top of the church. The dome, which was constructed on groud and covered in copper, was raised by a crane and with much precision placed on the roof of the church to the great amazement of the faithful. Afterward the cross was also raised, accompanied by hundreds of cameras of the faithful in attendance. This historic day in Orlando was completed with a lunch, a folklore program and speeches, the event was made all the more special through the attendance of representatives of the Serbian Ambassadors in Washington. Monetary contributions were collected on this occasion for the continuing of the construction of the church. We wish to thank all of those help us in this God-pleasing act with the wish and hope and we come together again for a similar event.